Shingon (真言) is a major school of Japanese Buddhism, and one of two major sub-schools of Vajrayana Buddhism, the other being Tibetan Buddhism. The word Shingon is a Japanese pronunciation of the Chinese term Zhen Yan meaning «True Word», which itself is a representation of the Sanskrit word for mantra. Shingon arose in Japan’s Heian period (794-1185) when the monk Kukai went to China in 804 where he studied the tantra and returned armed with many texts and art works, and developed his own synthesis of esoteric practice and doctrine, centred on the universal Buddha Vairocana (or, more accurately, Mahavairocana Tathagata). The teachings of Shingon are based on the Mahavairocana Sutra and the Vajrashekhara Sutra. These two mystical teachings are shown in the main two mandalas of Shingon, namely, the Womb Realm mandala and the Diamond Realm mandala. Vajrayana Buddhism is concerned with the ritual and meditative practices leading to enlightenment. According to Shingon, enlightenment is not a distant, foreign reality that can take eons to approach but our birth-right, a real possibility within this very life, based on the spiritual potential of every living being, known generally as Buddha-nature. If cultivated, this luminous nature manifests as innate wisdom. With the help of a genuine teacher and through properly training the body, speech, and mind, we can reclaim and liberate this enlightened capacity for the benefit of ourselves and others. In Shingon the Mahavairocana Tathagata is held to be the source and basis of all phenomena, present in each and every of them, and yet beyond all phenomena. The goal of Shingon is the realization that one’s nature is identical with Mahavairocana, a goal that is achieved through initiation, meditation and esoteric ritual practices. This realization depends on receiving the secret doctrine of Shingon, transmitted orally to initiates by the school’s masters. Body, speech, and mind participate simultaneously in the subsequent process of revealing one’s nature: the body through devotional gestures (mudra) and the use of ritual instruments, speech through sacred formulas (mantra), and mind through meditation. One feature that sets Shingon apart from the other surviving schools of esoteric Buddhism in Tibet is the use of calligraphy, along with more common pictorial representations, to represent Buddha figures in their mandalas. Such syllable-mandala is known as dharma-mandala. Other forms are samaya-mandala (symbolic representation), karma-mandala (statues) and maha-mandala (anthropomorphic). » An ancient Indian Sanskrit syllabary script known as siddham (Jap. bonji 梵字) is used to write mantras. A core meditative practice of Shingon is ajikan (阿字觀), «Gazing at the Letter ‘Ah'», which uses the siddham letter representing that sound as a . This is a practice cognate to others found in, e.g. Vajrayana Buddhism, such as a-khrid. Other Shingon meditations are Gachirinkan («full moon» visualization), Gojigonshinkan (five elements visualization) and Gosojoshinkan (five step transformation). Esoteric teachings are preached by the Dharmakaya Buddha which Kukai identifies with Mahavairocana. Exoteric teachings are preached by the Nirmanakaya Buddha, also known as Gautama Buddha, or one of the Sambhoghakaya Buddhas. Exoteric Buddhism holds that the ultimate state of Buddhahood is ineffable, and that nothing can be said of it. Esoteric Buddhism holds that it is not ineffable, and that it is readily communicated via esoteric rituals which involve the use of mantras, mudras, and mandalas. 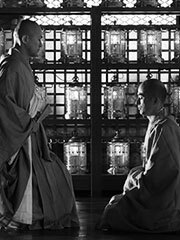 Kukai held that exoteric doctrines were merely provisional, skillful means on the part of the Buddhas to help beings according to their capacity to understand the Truth. The esoteric doctrines by comparison are the Truth itself, and are a direct communication of the «inner experience of the Dharmakaya’s enlightenment». Exoteric schools, in early Heian Japan at least, held that Buddhahood required three incalculable aeons of practice to achieve, whereas esoteric Buddhism holds that Buddhahood can be attained in this lifetime by anyone. Kukai held, along with the Hua-yen (Jp. Kegon) school that all phenomena were ‘letters’ in a ‘world-text’. Mantra, mudra, and mandala are special because they constitute the ‘language’ through which the Dharmakaya (i.e. Reality itself) communicates. Although portrayed through the use of anthropomorphic metaphors, Shingon does not see the Dharmakaya Buddha as a god, or creator. The Dharmakaya is in fact a symbol for the true nature of things which is impermanent and empty of any essence. The teachings were passed from Mahavairocana via a succession of mythic and historical patriarchs. The essence of Shingon Mantrayana practice is to experience Reality by emulating the inner realization of the Dharmakaya through the meditative ritual use of mantra, mudra and visualization of mandala (ie. the three mysteries). In order to accurately reproduce this innermost realization it is necessary to be initiated into the practice by a qualified teacher. Esoteric Buddhism is also practised, although to a lesser extent, in the Japanese Tendai School founded at around the same time as the Shingon School in the early 9th century (Heian period) as well as by shugenja, practitioners of shugendo, a form of mountain asceticism. Just as the Tibetans incorporated Bön elements into Buddhism, the Japanese incorporated aspects of their native Shinto religion. In particular the central Buddha figure of Mahavairocana (Jp. Dainichi), whose name means «Great Illuminating Sun», was identified with the sun goddess Amaterasu in popular usage.